This photo shows the full batten main. I sanded the top batten thinner to make it more flexible. 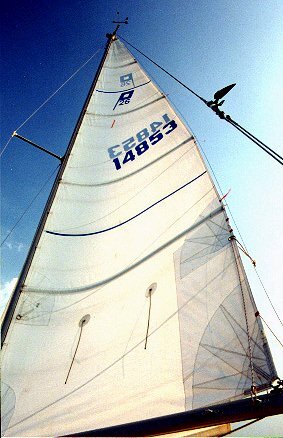 It is very short and the top of the sail seemed too flat. The reefing gear can also be seen. The reefing line runs up from a padeye on the starboard side of the boom, through the reef clew, down to a cheek block on the port side of the boom and forward to a cleat. We have one fairly deep reef in the main (4 feet for a sail area of about 115 sf). The main is fairly small and we have never felt the need for a second reef. We typically reef at close to 20 knots with the working jib, a bit lower if beating. I have set up a single line reefing system. A line runs from a padeye at the end of the boom up to the reefing clew (cringle), down to a cheek block, forward to another cheek block, up to the reefing tack and back dowm to a cleat on the boom. It takes about 32' of 5/16 line. Pulling the line in brings down the tack and clew. There is a small double loop of line tied to the reef clew. I connect the snap shackle on the outhaul to it when reefed for better control of the shape of the reefed sail. This has been very useful. Our main has a foot shelf in the bottom. This is an extra flap that provides a bit more area when you slack the outhaul on a run. 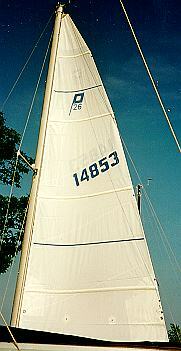 For the '98 season I did not put the foot of the sail into the slot on the boom. I wanted to see how the sail flew loose footed. I found that overall control over sail shape (especially in the lower third of the sail) was greatly improved. Some people say that flying the main loose footed like this eliminates (or reduces) the endplate effect of the boom. The end plate effect blocks air flow under the foot of the main which decreases it's efficiency. Deck sweeping genoas are an effort to exploit the endplate effect using the deck as the endplate. C.A. 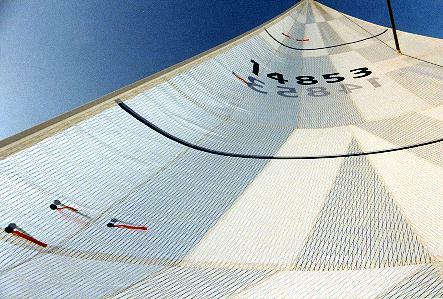 Marchaj studied this effect on the main sail in his classic text "Sailing Theory and Practice" and concluded that there is indeed an effect to be taken advantage of but you need an endplate about the size of a surf board on a sail this size. This is impractical on a boom like the P26's. I think the enhanced control over mainsail shape is more advantageous. If I were having a new main built I would get it loose footed with a big foot roach. Consult your sailmaker. The photo also shows the small windsurfer Windex I mounted to the backstay. This is a nice indicator of shear from the top of the mast to the bottom when you compare it to the masthead windex.